The Graham Heliflow is ideally suited for applications that have a liquid-to-liquid service requiring a heat exchanger. When designing the exchanger, the "dirty" fluid should be on the shellside of the unit. The Heliflow makes shellside cleaning easy. Cleaning can be done in-place, without breaking shellside or tubeside pipe connections. The flow pattern is 100% countercurrent that maximizes the temperature differential and thermal efficiency. Graham has conducted extensive research and development in the area of cryogenic vaporizers. Our research and many years of proven experience in this area confirm that the Heliflow heat exchanger is excellent for cryogenic applications. The unique tube coil of the Heliflow can easily accommodate the large temperature differentials that are typical in cryogenic units. 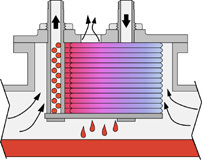 Heliflow Heat Exchangers often use cryogenic fluids as the cooling medium; alternately, Heliflows can be used to vaporize fluids, such as N2, O2, CO2, or other fluids. For information on this subject, refer to the Graham article titled Convective flow boiling in coiled tubes. High pressure applications are another way to utilize the Heliflow Heat Exchanger. The tubeside of the exchanger does not rely on gaskets for sealing, and can be designed to 15,000 psig. A key advantage that a Heliflow offers is that it has no flat sided pressure bearing surfaces that quickly become thick as design pressure increases. A Heliflow uses tubing and pipe to contain the tubeside's usually high operating pressure fluid. The shellside of the unit can be rated for pressures up to 5,000 psig. The Graham Heliflow meets the need for clean, chemical-free steam. This technology has been developed over the past 60 years to take advantage of the Heliflow coiled tube geometry. The stacked tube layout eliminates problems caused by thermal expansion and cycling. In addition, this design promotes nucleate boiling, resulting in superior heat transfer efficiency. The Graham Clean Steam Generator is designed to produce clean, chemical-free steam from clean feed water, using plant steam as the energy source. Boiler blowdown and process sample coolers are perfect applications for a Heliflow heat exchanger. The compact size of the Heliflow fits into tight spaces. Also, the Heliflow design can withstand the cyclic nature of blowdown service. When natural gas is passed through a pressure reducing station, it decreases in temperature. The compact Heliflow design is often used to increase the temperature of the natural gas. Heliflow Heat Exchanger technology is at the heart of Graham's vent condensers. Vent condensers are often used on storage tanks to reclaim products contained in the tank and control the harmful emissions that escape from the tank to atmosphere. During the day, the sun heats the fluid in the tank. The increase in the system's temperature will cause the vapors in the tank to expand and increase vaporization of the volatile components as their vapor pressures increase. By installing a vent condenser on the vessel, the condensable vapors are reclaimed and refluxed back into the storage tank. In addition to the venting caused by temperature changes, vapors are exhausted to atmosphere as the tank is filled. The vent condenser experiences the greatest thermal duty when the tank is being filled. The heat exchanger, therefore, should be sized based on the filling case. Graham has taken the lead in reducing VOC (volatile organic compound) emissions with our design of specialized vent condensers. These units often are used to recover valuable product and reduce the load on downstream pollution control equipment at the same time. Keeping the mechanical seal faces cool is extremely important in extending the operating life of mechanical seals. The unique design of the Graham Heliflow facilitates superior cooling of the seal flush fluid as compared to traditional mechanical seal coolers. Heliflow seal coolers can be fitted with vent connections which enable the units to meet the venting and draining requirements of API 682. In addition, Heliflow seal coolers have the ability to thermosiphon in the event of a pumping ring failure. API flush plans 21 or 23 are the common arrangements for configuring mechanical seal cooling systems. In Plan 21, the product from the pump discharge is circulated through a valve or orifice and then flows through a Heliflow seal cooler where it is cooled before returning to the mechanical seals. In API Plan 23, the product is recirculated from the stuffing box through the Heliflow and then back to the mechanical seal. Standard models are available in 316 stainless steel tubeside and cast iron shell. Options include 304 stainless steel, titanium, 70/30 cu.ni. tubes, 316 stainless steel and cast steel shell materials. Units can also be constructed to ASME Section VIII, Division 1 Code if desired. Sizing software is available from Graham to assist in selecting units for both API Plans 21 and 23. Standard Heliflow units do not conform with the tubing recommendations of API 682, however, specially designed units are available, which include 3/4" diameter x .095" wall thickness tubes to provide complete compliance with the standard. Heliflow Heat Exchangers are preferred for high pressure service, and are often used as inter and aftercoolers to cool the gases handled by reciprocating type compressors. Typical design pressure is 2500-5000 psig, however, units designed for up to 15,000 psig are available. Graham has extensive experience in engineering, design, and fabrication of units for compressor service. Supercritical water oxidation (SCWO) is a cutting edge technology developed for the treatment of hazardous waste solutions. This method uses high pressure, high temperature water at its supercritical state of 3200 psig and 705 degrees F. During this process, oxygen and the supercritical water are injected into the waste stream. The waste contaminants are oxidized, transforming them into carbon dioxide and other harmless substances. This process is cost competitive and more environmentally friendly than traditional disposal methods, such as landfill or incineration. Specially designed Heliflow Heat Exchangers with spherical casings are used to withstand the high operating pressures and temperatures required. These units are used to cool the reactor effluent, to generate steam, as a feed interchanger, and as sample coolers. Heliflow Heat Exchangers can save energy as heat recovery economizers. Waste heat is recovered and utilized to preheat incoming make-up water that is used in boilers or for other applications. Specially designed Heliflow Heat Exchangers are available for use when handling lethal liquids or vapors. These units are built to strict manufacturing, welding, and quality control specifications and include specially developed features to provide confidence when handling lethal fluids. The Heliflow Heat Exchanger design is often used to provide a compact vaporizer. The coiled tube bundle promotes nucleate boiling, and can easily handle the stresses caused by thermal expansion and cycling. Steam or other high temperature sources are often used to vaporize nitrogen, oxygen, carbon dioxide, hydrogen, methane, ethylene, various hydrocarbons, and many other fluids. Vaporizing can be achieved either shellside or tubeside according to process requirements. The compact footprint of the Heliflow Heat Exchanger, along with its ability to handle frequent cycling and wide temperature differentials make this unit ideal for use in sample cooler applications. Heliflow Heat Exchangers can heat water using steam or high temperature hot water (or other fluids) as the energy source. When control of the water temperature is important, temperature control valves are often used with the Heliflow design. If the water flow rate varies, and outlet temperature must be controlled, Graham offers our packaged MicroMix II instantaneous, steam-fired, hot water heaters. A benefit of Heliflow Heat Exchangers at higher temperatures is the ability of the coil to flex as it is heated. As the tubes are heated, they grow due to thermal expansion. Because the Heliflow bundle is free to move, the units can undergo many years of cyclic operation without problem. A major drawback for many other types of exchangers is reduced operating life when working at higher temperatures, or the exchanger must include expensive expansion joints. A Heliflow Heat Exchanger is the best choice for high temperature applications. 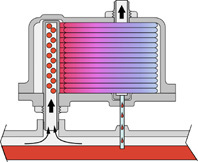 Freeze condensers fall into two categories; the first includes vapors that condense, then freeze in the heat exchanger. 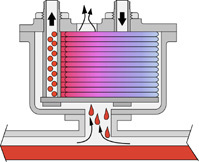 The second category typically includes nonfreezing condensables mixed with water vapor or another component, which does freeze. Both applications are similar in that the objective is to condense and remove from the vent stream as much of the vapor component as possible. The most effective method is to cool the vapor below its freezing point, however, once a component begins to freeze, the heat transfer rate is gradually decreased. To obtain the best efficiency, often two parallel units are used. One unit operates, while the other undergoes a thaw cycle. Graham is uniquely experienced in the field of freeze condenser technology. Our Heliflow Heat Exchangers can be provided based on system requirements. Years of experience and numerous research projects enable Graham to provide "Engineering Answers" tailored to specific applications. The coiled tube geometry of the Heliflow Heat Exchanger provides increased heat transfer efficiency, making these units ideal for use as oil coolers.